Background: SOX 2 and OCT 4 are cancer stem cell (CSC) markers required for the maintenance of pluripotency and self-renewal of stem cells. They have been found to play a role in tumorigenesis. This study was conducted to detect and compare the expression of CSC markers OCT 4 and SOX 2 in ameloblastoma and keratocystic odontogenic tumor (KCOT) and to evaluate which marker better stains the stem cell population in the above-mentioned entities. Materials and Methods: Paraffin sections of 15 KCOT's and 15 solid multicystic ameloblastomas were obtained from the archives. Immunohistochemical staining for OCT 4 and SOX 2 was performed using monoclonal rabbit antibodies (PathnSitu Biotechnologies Pvt. Ltd). Immunopositivity was determined on the basis of dark brown staining of nucleus and a total of 1000 cells were counted in five representative areas at a magnification of ×400. Results: No OCT 4 positivity was found in ameloblastoma or KCOT. Ameloblastoma showed SOX 2 negativity while high SOX 2 expression was found in KCOT. Conclusion: SOX 2 is a more reliable marker for identifying stem cell population in KCOT. High expression pattern of SOX 2 in KCOT may also explain the aggressive nature of lesion and account for the presence of numerous daughter cysts responsible for its high recurrence rate, and hence, may be helpful to justify its reclassification as a tumor. Targeted therapies may be designed against these CSC populations to render more effective treatment, prevent recurrence, and reduce morbidity of the patients. Among the various odontogenic tumors encountered in the oral and maxillofacial region, ameloblastomas account for 36.9% while keratocystic odontogenic tumor (KCOT) accounts for 14.3% of all odontogenic tumors. Very few studies have been done to investigate the expression pattern and role of SOX 2 and OCT 4 in odontogenic lesions. This study aims at detection and comparison of stem cells in the above-mentioned two odontogenic tumors using two potential markers, namely, SOX 2 and OCT 4, and to determine which marker is more suitable for identification of stem cells in odontogenic lesions. Our study appears to be the first one in India, to do so. The present study aimed at detection and comparison of the expression of stem cell markers, OCT 4 and SOX 2, in ameloblastoma and KCOT. Approval from the Institute Ethics Committee (Reference No. : KIMS/KIIT/IEC/48/2016) was taken before pursuing the research project. A retrospective study was planned and paraffin wax blocks of 15 histopathologically diagnosed cases of KCOT's and 15 solid multicystic ameloblastomas (SMA) were included in the study. Cases without proper epithelial lining in regard to KCOT and cases of unicystic ameloblastoma were excluded from the study. The paraffin blocks were retrieved from the archives of the Department of Oral Pathology and Microbiology, Kalinga Institute of Dental Sciences, Bhubaneswar. Two sections each of 4 µm sections were obtained and subjected to immunohistochemical staining for OCT 4 and SOX 2 using PolyExcel HRP/DAB detection system (PathnSitu Biotechnologies Pvt. Ltd). The sections were deparaffinized, rehydrated, and subjected to antigen retrieval using pressure cooker technique by immersing the sections in tris ethylenediaminetetraacetic acid buffer. The sections were then subjected to peroxide block for 15 min to block endogenous peroxide activity and incubated with the primary antibodies for 45 min at room temperature in a humid chamber. The primary antibodies used were anti-SOX 2 and anti-OCT 4 monoclonal rabbit antibodies, PathnSitu Biotechnologies Pvt. Ltd. The sections were then subjected to treatment with target binder and HRP polymer for 12 min each, followed by application of DAB chromogen for 5 min. In between the steps, the sections were washed using the immunowash buffer. Hematoxylin was used as a counterstain. The slides were then washed in running tap water for 5 min, dehydrated in ascending grades of alcohol, subjected to treatment with xylene for clearing, mounted using DPX, and air dried. Seminoma and glioma were used as the positive controls for OCT 4 and SOX 2, respectively. Three blinded investigators independently evaluated the results of immunostaining. Immunopositivity was determined on the basis of dark brown staining of nucleus of the tumor cells. The sections were quantitatively analyzed. Five high-power fields (×400) were randomly selected in each case, and a total of 1000 cells were counted by each investigator. Average count was determined in each case. Counts were expressed as percentages and a scoring index was allotted. If <5% of the nuclei showed positivity, it was considered negative. 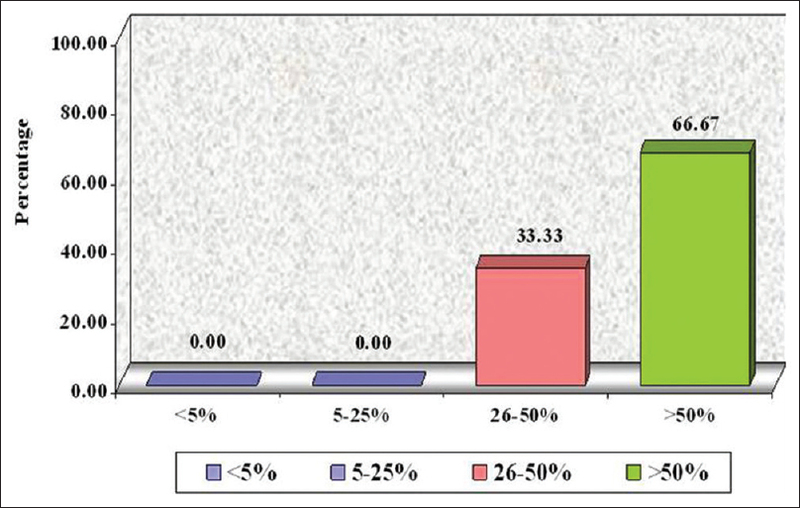 If the percentage ranged between 5% and 25%, 26% and 50%, and >50%, scores of 1, 2, and 3 were allotted, respectively. Results were descriptively analyzed. All the KCOT cases were widely positive for SOX 2 [Figure 1], whereas ameloblastoma showed negative staining for SOX 2 [Figure 2]. 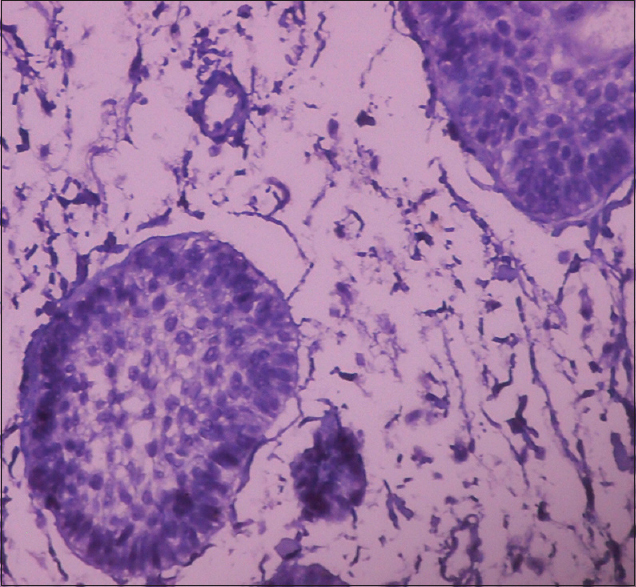 Both ameloblastoma and KCOT cases selected for the study showed negative staining for OCT 4 [Figure 3] and [Figure 4]. Out of 15 KCOT cases, three cases were allotted a score of 2 while 10 cases were assigned a score of 3, i.e., more than 50% of the cells showed immunopositivity [Figure 5]. Most of the positively stained cells were situated in the basal and suprabasal layer. SOX 2 protein contains a high mobility group domain, which has above 50% similarity to the mammalian testis-determining factor SRY. SOX 2 is required for self-renewal and differentiation of ESCs. Moreover, it has been linked to the process of tumorigenesis. It has also been linked to aggressive clinical course and poor prognosis in ovarian cancer, urothelial carcinoma, breast carcinoma, esophageal carcinoma, nasopharyngeal carcinoma, and oral squamous cell carcinoma. In our study, we did not find a positive expression for either of the two markers in SMA. Similar negative expression of SOX 2 in ameloblastoma was obtained by Lei et al. and Banerjee et al., This might suggest the lack of a CSC subpopulation in ameloblastoma. However, Juuri et al. reported positive SOX 2 expression in the epithelial cells of follicular and plexiform ameloblastomas. Since the expression of OCT 4 rapidly decreases upon differentiation, it would explain the negative results obtained in both ameloblastoma and KCOT where the cells have differentiated to cap/bell stage of odontogenesis and stratified squamous epithelium, respectively. Heikinheimo et al. and Banerjee et al. found the expression of epithelial stem cell marker SOX 2 to be significantly upregulated in KCOT which was in accordance with our study., This may be since the cells in the basal and suprabasal layer of epithelium in KCOT have the property of dedifferentiation. This may also suggest that KCOT shows differentiation toward keratinocytes. Expression of SOX 2 has been found to be proportional to the rate of progression of the disease. High SOX 2 expression in KCOT as found in our study may explain the high mitotic index and aggressive nature of the lesion. Moreover, the property of dedifferentiation of the basal and suprabasal cells in KCOT may explain the recurrence due to satellite cysts. These findings justify the reclassification of this entity as a tumor. 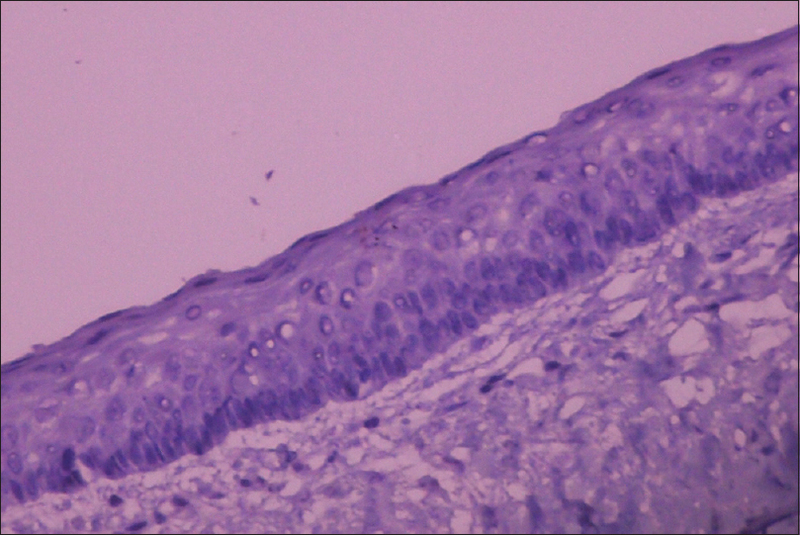 Among other odontogenic lesions, SOX 2 is expressed in the epithelial basal proliferative zone in dentigerous cysts. Lei et al. evaluated the role of SOX 2 in ameloblastoma, atypical ameloblastoma (AA), and ameloblastic carcinoma (AC). They found SOX 2 staining to be essentially negative in most of the ameloblastoma and AA cases while a significantly higher immunohistochemistry (IHC) score was seen in AC. They concluded that SOX 2 could be used as a marker for AC as well as for high-grade transformation in ameloblastic neoplasms. Banerjee et al. performed IHC in dentigerous cyst, radicular cyst, adenomatoid odontogenic tumor (AOT), and AC using SOX 2 and OCT 4. In dentigerous cyst, SOX 2 showed nuclear positivity in basal cells while OCT 4 showed negative immunoreactivity. OCT 4 positivity was seen in very few suprabasal cells of odontogenic epithelium in radicular cysts. AOT showed positive expression for both SOX 2 and OCT 4 in its tumor component. In AC, SOX 2 showed intense positive nuclear immunoexpression in tumor cells while OCT 4 staining showed positivity in few tumor cells interspersed between stromal cells. [Table 1] gives a systematic review of various immunohistochemical studies done on odontogenic lesions using stem cell markers, SOX 2 and OCT 4. KCOTs have a tendency to recur after surgical treatment. This has been attributed to various factors such as occurrence of satellite cysts which may be retained during a surgical procedure, incomplete enucleation procedure, thin fragile lining of KCOT which are difficult to enucleate and may be left behind, innate tendency of the patients to develop cysts from any dental lamina remnant, intrinsic growth potential of the epithelial lining of the entity or to the fact that these may also arise from proliferations of offshoots of the basal layer of oral mucosa, and the failure of removal of the overlying epithelium may result in recurrence. We here hypothesize the presence of CSC population as a possible reason for recurrence of KCOTs as these cells have the property of self-renewal and pluripotency. Thus, targeting these cells may help in preventing the recurrence of these lesions. Our study showed high SOX 2 expression in KCOT, thus making SOX 2 a more reliable marker for identifying stem cell population in KCOT. Based on the results obtained by our study and evidence from literature, it can be stated that SOX 2 is a better marker than OCT 4 for identifying stem cells in odontogenic lesions. The drawback of our study was the limited sample size. More immunohistochemical studies with increased sample size along with CSC isolation techniques (in vitro - sphere-forming assays, Hoechst dye exclusion, detection of surface markers, signalling pathway identification, serial colony-forming unit assays, label-retention assays, migration assays; in vivo - serial transplantation in animal models) have to be undertaken for identification and isolation of these CSC population. Accordingly, target-based therapies can be designed against these cells for effective management, prevention of recurrence, and reduction of morbidity and mortality of patients. Rajendran R. Cysts and tumors of odontogenic origin. In: Rajendran R, Sivapathasundaram B, editors. Shafer's Textbook of Oral Pathology. 5th ed. New Delhi: Elsevier; 2006. p. 357-432. Kumamoto H. Molecular pathology of odontogenic tumors. J Oral Pathol Med 2006;35:65-74. Shanbhag VG. Understanding cancer stem cells in head and neck cancer: An insight from oral medicine point of view. Oncobiology Targets 2015;2:24-8. Greenow K, Clarke AR. Controlling the stem cell compartment and regeneration in vivo: The role of pluripotency pathways. Physiol Rev 2012;92:75-99. Chen C, Wei Y, Hummel M, Hoffmann TK, Gross M, Kaufmann AM, et al. Evidence for epithelial-mesenchymal transition in cancer stem cells of head and neck squamous cell carcinoma. PLoS One 2011;6:e16466. Atena M, Reza A, Mehran G. A review on the biology of cancer stem cells. Stem Cell Discov 2014;4:83-9. Chen ZG. The cancer stem cell concept in progression of head and neck cancer. J Oncol 2009;2009:894064. Nassar D, Blanpain C. Cancer stem cells: Basic concepts and therapeutic implications. Annu Rev Pathol 2016;11:47-76. Ward RJ, Dirks PB. Cancer stem cells: At the headwaters of tumor development. Annu Rev Patholo Mech Dis 2007;2:175-89. Enderling H. Cancer stem cells: Small subpopulation or evolving fraction? Integr Biol (Camb) 2015;7:14-23. Ren ZH, Zhang CP, Ji T. Expression of SOX 2 in oral squamous cell carcinoma and the association with lymph node metastasis. Oncol Lett 2016;11:1973-9. Boumahdi S, Driessens G, Lapouge G, Rorive S, Nassar D, Le Mercier M, et al. SOX 2 controls tumour initiation and cancer stem-cell functions in squamous-cell carcinoma. Nature 2014;511:246-50. Houghton J, Stoicov C, Nomura S, Rogers AB, Carlson J, Li H, et al. Gastric cancer originating from bone marrow-derived cells. Science 2004;306:1568-71. Matchett KB, Lappin TR. Concise reviews: Cancer stem cells: From concept to cure. Stem Cells 2014;32:2563-70. Zhang P, Zhang Y, Mao L, Zhang Z, Chen W. Side population in oral squamous cell carcinoma possesses tumor stem cell phenotypes. Cancer Lett 2009;277:227-34. Chen K, Huang YH, Chen JL. Understanding and targeting cancer stem cells: Therapeutic implications and challenges. Acta Pharmacol Sin 2013;34:732-40. Major AG, Pitty LP, Farah CS. Cancer stem cell markers in head and neck squamous cell carcinoma. Stem Cells Int 2013;2013:319489. Sarkar A, Hochedlinger K. The Sox family of transcription factors: Versatile regulators of stem and progenitor cell fate. Cell Stem Cell 2013;12:15-30. Weina K, Utikal J. SOX 2 and cancer: Current research and its implications in the clinic. Clin Transl Med 2014;3:19. Ashok KA, Reddy KV. OCT 4: More than a pleuripotent marker? Yakhteh Med J 2009;11:1-12. Zeineddine D, Hammoud AA, Mortada M, Boeuf H. The OCT 4 protein: More than a magic stemness marker. Am J Stem Cells 2014;3:74-82. Johnson NR, Gannon OM, Savage NW, Batstone MD. Frequency of odontogenic cysts and tumors: A systematic review. J Investig Clin Dent 2014;5:9-14. Wang X, Dai J. Concise review: Isoforms of OCT 4 contribute to the confusing diversity in stem cell biology. Stem Cells 2010;28:885-93. Okamoto K, Okazawa H, Okuda A, Sakai M, Muramatsu M, Hamada H. A novel octamer binding transcription factor is differentially expressed in mouse embryonic cells. Cell 1990;60:461-72. Rosner MH, Vigano MA, Ozato K, Timmons PM, Poirier F, Rigby PW, et al. A POU-domain transcription factor in early stem cells and germ cells of the mammalian embryo. Nature 1990;345:686-92. Siu A, Lee C, Dang D, Lee C, Ramos DM. Stem cell markers as predictors of oral cancer invasion. Anticancer Res 2012;32:1163-6. Tsai LL, Yu CC, Chang YC, Yu CH, Chou MY. Markedly increased OCT 4 and Nanog expression correlates with cisplatin resistance in oral squamous cell carcinoma. J Oral Pathol Med 2011;40:621-8. Ge N, Lin HX, Xiao XS, Guo L, Xu HM, Wang X, et al. Prognostic significance of OCT 4 and SOX 2 expression in hypopharyngeal squamous cell carcinoma. J Transl Med 2010;8:94. Lei Y, Jaradat JM, Owosho A, Adebiyi KE, Lybrand KS, Neville BW, et al. Evaluation of SOX 2 as a potential marker for ameloblastic carcinoma. Oral Surg Oral Med Oral Pathol Oral Radiol 2014;117:608-16. Banerjee A, Kamath VV, Sundaram L, Krishnamurthy SS. OCT 4 and SOX 2 are reliable markers in detecting stem cells in odontogenic lesions. J Orofac Sci 2016;8:16-21. Lei Y. Recent advances in the ancillary studies for diagnosing odontogenic carcinomas. J Adv Oral Res 2014;5:1-2. Juuri E, Isaksson S, Jussila M, Heikinheimo K, Thesleff I. 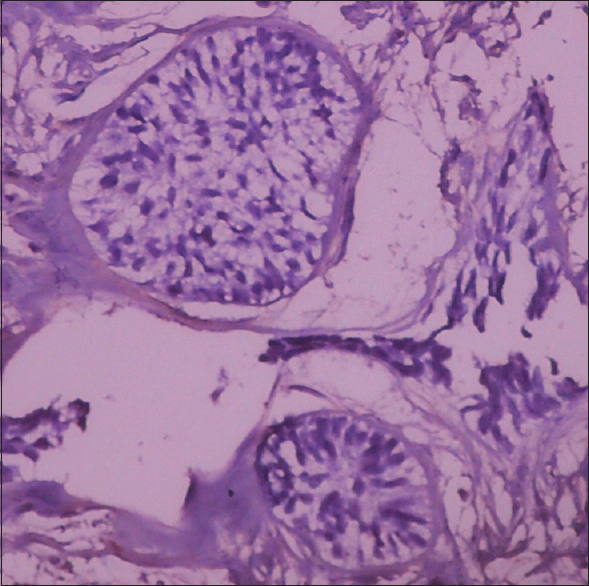 Expression of the stem cell marker, SOX 2, in ameloblastoma and dental epithelium. Eur J Oral Sci 2013;121:509-16. Heikinheimo K, Kurppa KJ, Laiho A, Peltonen S, Berdal A, Bouattour A, et al. Early dental epithelial transcription factors distinguish ameloblastoma from keratocystic odontogenic tumor. J Dent Res 2015;94:101-11. Qiao B, He B, Cai J, Yang W. The expression profile of OCT 4 and SOX 2 in the carcinogenesis of oral mucosa. Int J Clin Exp Pathol 2013;7:28-37. Shear M, Speight PM. Cysts of the Oral and Maxillofacial Regions. 4th ed. Oxford, UK: Blackwell Publishing Ltd.; 2007. Han L, Shi S, Zhang Z, Sun X. Cancer stem cells: Therapeutic implications and perspectives in cancer therapy. Acta Pharm Sin B 2013;3:65-75.